I sure do love an extra day in the weekend. I hope you are doing something fun and relaxing today! An extra day for me means more time to play in my craft room. I finally felt like I was caught up on my chores etc. to take a little time to hide away. Have you ever gone to the store and saw something that you thought would make a great card? A pattern, clothing, rugs and so on? Every time I wear a certain dress that I own I tell myself I'm going to make a card inspired by it. Today was the day and I wasn't even wearing the dress. I actually ended up taking a picture of the dress to use as inspiration whenever I had the chance. 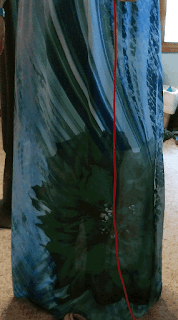 Here is a picture of the skirt portion of the dress causing all this inspiration. Look at that gorgeous dark green and navy flower! Beautiful swirls on the background! This is one of my favorite dresses for so many reasons! I tried to think about which medium to use to recreate something similar to the design. I think there are many different ones I can play with but I decided to go with alcohol inks. I felt I could get some nice, bold color. I played around with bottle green, denim blue and snow cap mixative. I applied the colors to a felt dauber, squirted on some blending solution and swiped it diagonally across the Yupo paper. I did it several times but never really got the stripe look I was going for. In fact, my background ended up way more muted than I intended. That aside, here is the finished card. And I can't let you miss out on all the silver foil accents! 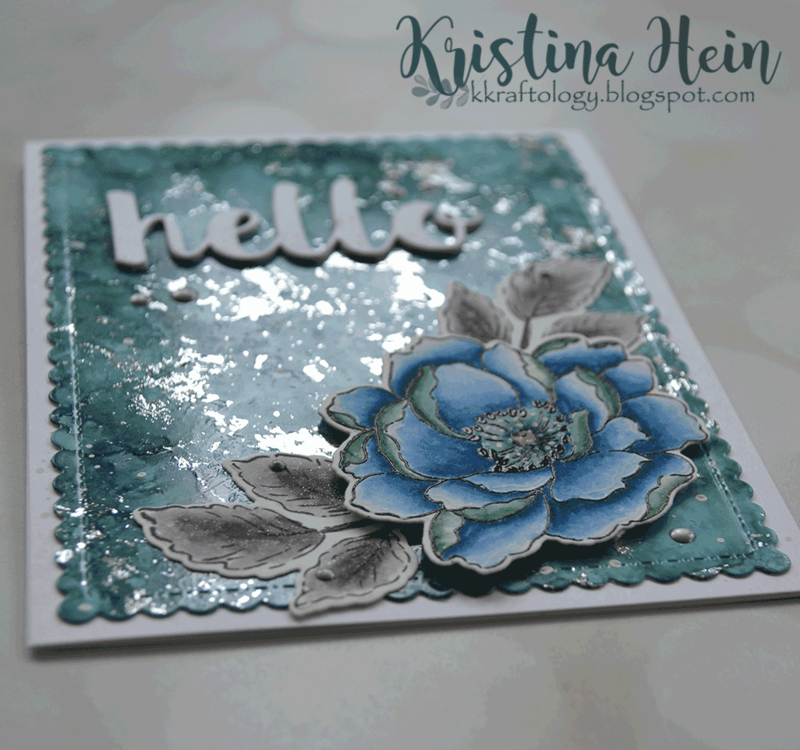 Tim Holtz Alcohol inks-Bottle, denim and snow cap. Plus blending solution. 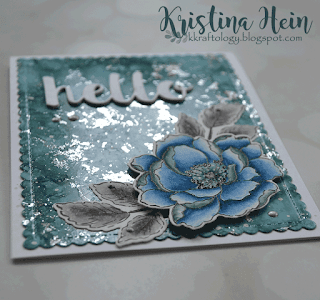 Silver deco foil applied while areas of the back ground were still slightly tacky in spots. White splatters added using Copic Opaque white mixed with water. The flower and leaves are from the Altenew set Beautiful day. The flower and leaves were stamped on Bristol cardstock and colored with Zig Clean Color real brush markers. Deep green & Peacock blue for the flower, Natural gray for the leaves. I added glitter marker to the leaves and some white gel pen accents to the flowers. Leaves are adhered directly to the Yupo but I added foam behind the flower. Yupo paper was cut out with one of my favorite dies from Mama Elephant All Prettied up set. 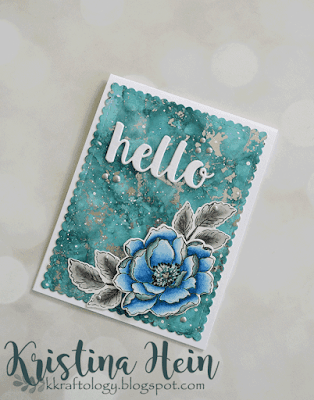 Hello sentiment is from MFT Stamps. I cut it four times and layered them up. The top layer I went over with a Spectrum Noir glitter marker. I adhered the entire piece to a white, top fold cardstock base. For the finishing touch I added Nuvo crystal drops in Liquid Mercury. I do love how it turned out but I'm thinking I'm going to have another go at this down the road. I really want those colors to be vivid and bright!